A few years ago Luke & I made a big transition in our lives. We had realized that the church we were in was not a place for us to grow anymore and was actually having more of a destructive impact on us. We decided to leave and in that time we felt hurt, disappointed and alone. Soon after we started attending another church. And this is where this girl comes in. Her dad was the pastor at the time, and this church and her family were just what we needed. A breath of fresh air, love, and kindness. This family has faced many heartaches and battles, and yet the joy they exude is such an incredible gift they give to others. Ashlea has finally found the one that she has waited and prayed for. I will admit I had my preconceived ideas. I couldn’t imagine anyone being able to fill the shoes of being her husband. And then I met Dalton. A perfect gentlemen and completely down to earth. In a matter of minutes I liked him and them two together are perfect. Dalton & Ashlea live in Alabama. Their wedding is this July. 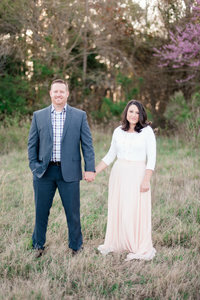 We have already rescheduled their engagement session due to rain in the forecast. When they made plans to drive up to Virginia for the second time, rain was in the forecast, not little sprinkles but full out storms! And yet, here they were and we had to make this work! CNU was a great place to start with all the covering and the pretty white contrast against their outfits. We did get pretty wet walking to and from our spots, but they were such good sports! Lastly, we drove to Hampton to McDonalds Garden Center where they allowed us to use their greenhouse for some fun pictures where it was nice and dry! I cannot thank the staff enough for their kindness! Luke & I are so excited for their July wedding in Alabama. We cannot wait to see their parents, siblings, and all their friends come together for this wonderful celebration. Thank-you Dalton & Ashlea for having us! You two are an amazing couple and we are so happy for you both!